I illustrated this cover some time ago but could not explain it. 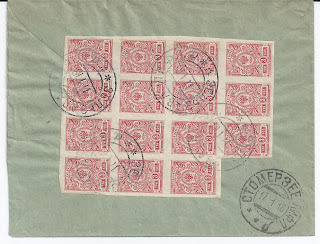 It was sent from Cyrillic ZELZAVA LIFL[and] 17 1 18 addressed in Cyrillic with a Cyrillic STOMERSEE LIFL [and] 17 1 18. 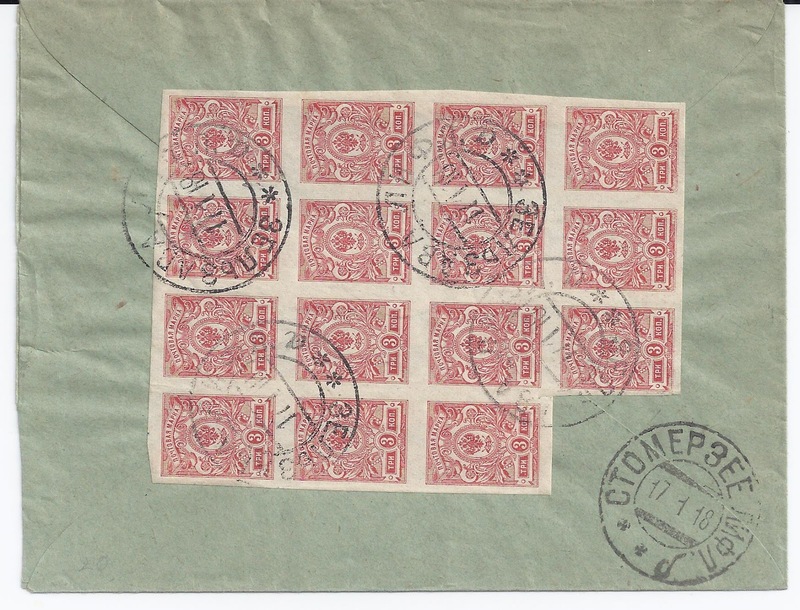 It's registered and franked at 45 kopeks, which probably represents 15 kop for postage and 30 kop for Registation - not an RSFSR rate. Both the postmark towns are in the district of Madona on the Plavinas - Vecgulbene railway. 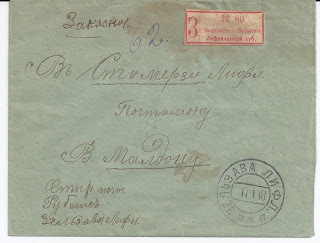 The most notable feature of the cover is the presence of an Imperial style Registration but one which is bi-lingual with both Cyrillic and a Latvian SELSAWA [ a variant - other possibilities are Dzelsawa and Dzelzava and German Selsau ]. This label is the only internal bi-lingual Registration label I have ever seen before they were introduced and became common in the 1920s in various Soviet republics. Now I have the explanation. As early as 29 July 1917 an Executive Committee of the Workers, Soldiers and Landless in Latvia [ISKOLAT] was established in Riga. Russia at this time was under the Provisional Government. German forces advanced on Riga capturing it on 3 September 1917. The ISKOLAT then moved to Cesis [Wenden] and then to the Valka [ Walk ] district. When the Germans renewed their offensive in February 1918 [ Operation Faustschlag] the ISKOLAT moved to Moscow. But for a brief period at the very end of 1917 and into early 1918, following the German-Bolshevik Armistice of December 1917, there were some areas of Lifland under accepted Bolshevik rather than German control. 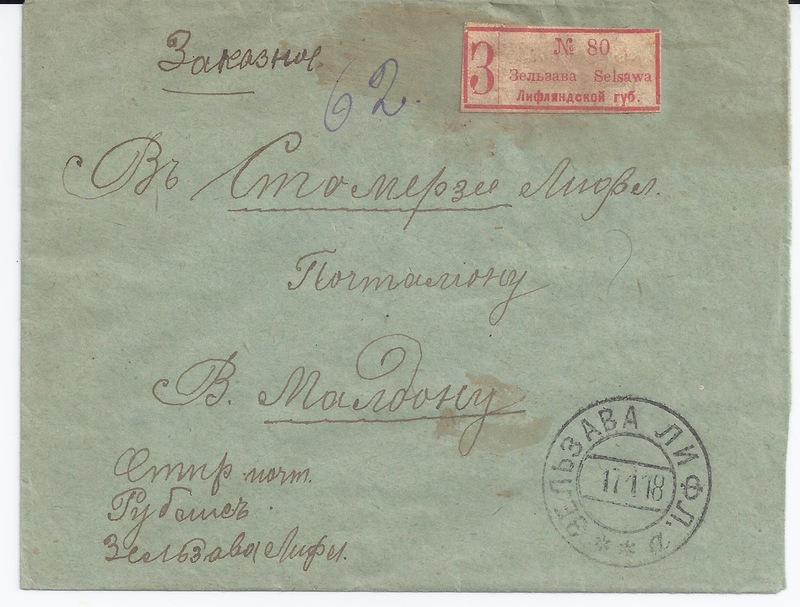 I think the above cover is an example of mail from a Bolshevik-controlled area of Lifland, and I think the Registration label is a locally-produced post-Imperial effort opening up an acknowledgment of the linguistic character of the area. This cover is for sale.